... is the only museum of its type in the Ruhr region and is among the largest fire brigade museums in Germany. Especially impressive is the collection of turntable ladder vehicles, fire trucks and ambulances from bygone days. 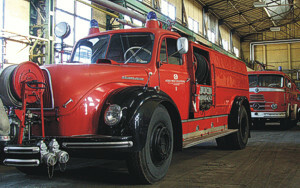 The oldest vehicle, a heavy brigade truck of the model Klöckner-Humbold-Deutz, was manufactured in 1942, and the newest "treasure," a turntable ladder IFA DL 30 from the GDR's inventory, in 1986. The sparks in the visitors' eyes reveal their fascination for fire fighting. They reflect memories and the "eternal dream of the fireman." The elementary transformation of fire fighting since WWII, in particular, is documented. Industrial fire protection, environmental protection and rescue services are given primary consideration. The museum, however, offers much more. "Elementary fire fighting training" and fire truck rides within the scope of the Industrial Culture Night are part of the annual program, as well as the highlight of the season, the museum festival, better known as the "Alarm." Once or twice a year the museum goes on tour, offers musicians a platform for concerts, and presents a Christmas season fire prevention program with the motto "Lichterloh" (up in flames). Please inquire for actual opening times!